I was having a pantry clear out last week expecting to find a few items close to their best before dates. To my surprise I only found one – a full bottle of premium fish sauce containing 72% anchovies (with salt the other ingredient). With a month to go before it passed its prime I had to get some use out of it – and that’s where this jam comes in. 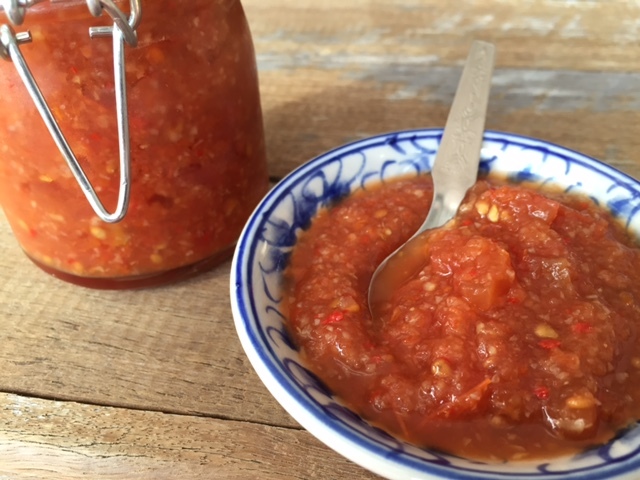 This recipe not only uses fish sauce but it also gave me an excuse to use some recently sterilised mini jars (they previously housed jelly beans at my husband’s office) and my shiny new food processor. Cut 500g of the tomatoes into small 5mm pieces, keeping the skin and seeds. 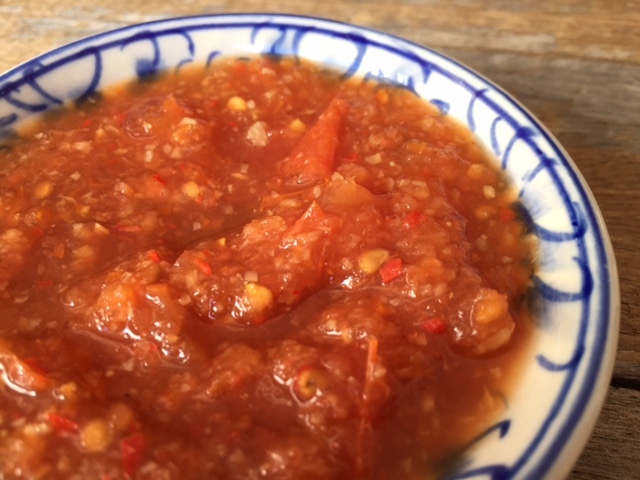 Blend the other 500g tomatoes with the chillies, garlic, ginger and fish sauce in a food processor until you have a smooth purée. Add the vinegar then transfer the purée to a large saucepan. Bring to the boil slowly, stirring constantly. Reduce to a simmer and add the remaining chopped tomatoes. Skim off any foam and cook gently for 30-40 minutes, stirring every 5 minutes. Scrape the sides off the saucepan during the cooking time so that the jam cooks evenly. Transfer to sterilised glass jars and allow to cool. Store in the fridge or a cool cupboard. 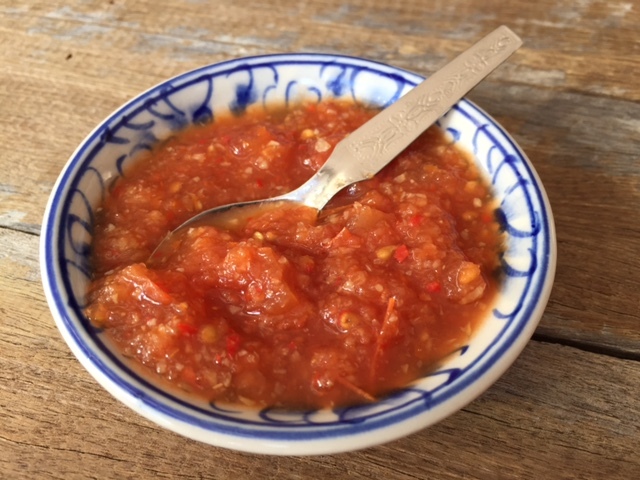 So far I’ve enjoyed this jam spread on my home-made paleo bread but you could also serve it with sandwiches, meat and as an accompaniment to Asian food. 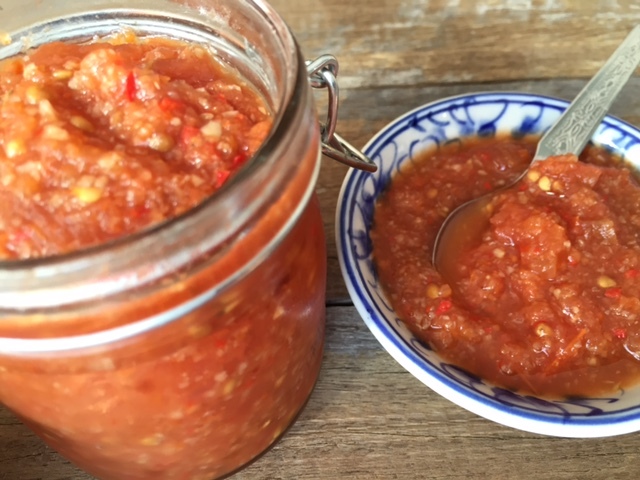 Tags: chilli, jam, no sugar, recipe, sauce, tomato. Bookmark the permalink. This must be fantastic! Good call on leaving out the sugar. 🙂 I bet it would be delicious as a dip for crispy potatoes. Yum! Yes it is and I can honestly say it really doesn’t need the sugar – it’s really simple to make and can keep in the fridge for weeks….. Very nice 🙂 I’ve never even tried fish sauce though, it just doesn’t appeal to me, what would you substitute? Thanks Elaine – you could substitute a few anchovies or perhaps soy sauce or even fresh lime juice…. There is nothing I wouldn’t serve this with: cheese and crackers / rice and fish / Mexican / curries… a perfect all-rounder!